Scientists working on the world’s biggest machine are being besieged by phone calls and emails from people who fear the world will end next Wednesday, when the gigantic atom smasher starts up. The Large Hadron Collider near Geneva, where particles will begin to circulate around its 17 mile circumference tunnel next week, will recreate energies not seen since the universe was very young, when particles smash together at near the speed of light. The head of public relations, James Gillies, says he gets tearful phone calls, pleading for the £4.5 billion machine to stop. “They phone me and say: “I am seriously worried. Please tell me that my children are safe,” said Gillies. Emails also arrive every day that beg for reassurance that the world will not end, he explained. There have also been legal attempts to halt the start up. The remarkable outpouring of concern about turning on the experiment, the most ambitious in history, comes as a new report concludes that it poses no threat to mankind. Since 1994, when the collider was first mooted by the multi-national European nuclear research organisation (CERN), dogged doomsayers have claimed that there would be a small but real risk that an unstoppable cataclysm would take place. Many of the emails received by Gillies cite a gloomy book – Our Final Century? : Will the Human Race Survive the Twenty-first Century? – written by Lord Rees, astronomer royal and president of the Royal Society. The new report published today provides the most comprehensive evidence available to confirm that nature’s own cosmic rays regularly produce more powerful particle collisions than those planned within the LHC. The LHC Safety Assessment Group has reviewed and updated a study first completed in 2003, which dispels fears of universe-gobbling black holes and of other possibly dangerous new forms of matter, and confirms that the switch-on will be safe. The report, ‘Review of the Safety of LHC Collisions’, published in the Journal of Physics G: Nuclear and Particle Physics, proves that if particle collisions at the LHC had the power to destroy the Earth, we would never have been given the chance to worry about the LHC, because regular interactions with more energetic cosmic rays would already have destroyed the Earth. The Group compares the rates of cosmic rays that bombard Earth to show that hypothetical black holes or strangelets, that have raised fears in some, will pose no threat. As the Group writes, “Each collision of a pair of protons in the LHC will release an amount of energy comparable to that of two colliding mosquitoes, so any black hole produced would be much smaller than those known to astrophysicists.” They also say that such microscopic black holes could not grow dangerously. As for the equally hypothetical strangelets, the review uses recent experimental measurements at the Brookhaven National Laboratory’s Relativistic Heavy-Ion Collider, New York, to prove that they will not be produced in the LHC. 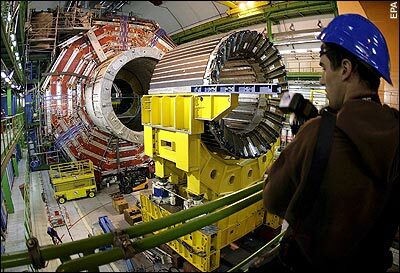 The collider is designed to seek out new particles including the long-awaited Higgs boson responsible for making things weigh what they do, the possible source of gravity called dark matter, as well as probe the differences between matter and antimatter.